During the summer of 2013, Prof. Marcus Key, Liz Plascencia '16, Melanie Campbell '15, Leslie Milliman '14 and Aleksander Perpalaj '14 joined John '78 and Susan Wycoff Pohl '80 and Pohls' daughter Merryl, a 6th-grade science teacher, on an Arctic adventure to Baffin Island. Read about the arctic, view images taken during the trip and listen to the students as they reflect on the experience. The Arctic. The final day. Blue skies and air you could drink. Then the satellite call came through. Eclipse Inlet, a 22-kilometer-wide fjord just south of the Northwest Passage was running seas 10 – 15 feet high – too rough for the boat to pick us up. This was a mere 10 kilometers north east of our camp on Curry Island. Where we were, the water was flat. But Eclipse Inlet was our way back to Pond Inlet (Mittimatalikvv in Inuktitut). We packed up and waited. The Arctic is giant. No trees. Just space. Winds could develop quickly and then dissipate. For us, the day was pleasant and it would be light well after midnight. It became late afternoon. Then we saw them. Narwhals – an entire pod racing across the sound. Monodon Monoceros the northernmost whale on the planet with its unique single tooth extending up to 3 meters long – and invoking images of unicorns. The second call came. A break in the day – and the 9-meter aluminum craft made it to our pick up point. We’d leave the kayaks – they would come back for them later. Despite the clear weather and apparent calm waters around us the Inuit captain assured us it was much rougher on the outside. He made his money in the short 2-month season ferrying adventurers, when there was no ice, and he knew these waters. And they hunted the very magical creatures we had just seen. Narwhals are a major food source for a population that lives on subsistence hunting. We are too far north for crops to be grown or livestock to survive. The surrounding seas are frozen until mid-July so food has to be flown in. Now we had to move quickly. It felt funny having to get into our giant orange survival suits for the ride, but as we left our quiet waters and entered Eclipse Inlet we got hammered. Swells rose above us as the Captain gunned his engines to surf the waves and escape being swallowed by the successive rollers. We made it across the first open section of water and the waves became a little less formidable. It was already 10 pm yet the sun was well above the horizon. The 1000 foot cliffs carved by the glaciers glowed above us and as we hugged the shoreline we could see the ancient beaches that had lifted up due to isostatic rebound after the weight of the great ice sheets that had formed the cliffs and fjord had receded. We were greeted on the beach by townspeople and everyone helped to pull the boat out of the water. After 9 days of wilderness. It was time to go home. *For a definition, see our glossary. What the Arctic conjures up in your imagination may be based on words, fact or fiction, images or drawings, or even just a sense of what it means to you. Experience may change everything. This exhibit starts with a series of photographic images depicting the Dickinson College’s Geology expeditions to the Arctic Regions. The first series being displayed is a trip to Baffin, Bylot and Curry Island in August 2013. Lying approximately 400 miles north of the Arctic Circle the land is snow covered and the waters are frozen in winter, but in August the ice had melted, and nature was in full force. These photographs and stories are meant to give the viewer an opportunity to see a thin slice of both time and location to get a glimpse into the Arctic. To help give the viewer a sense of being there – to further the pool of knowledge so that all of us can make informed critical decisions about our place and impact on the planet we live. It is an attempt to bring some of that experience to you. This is not just about showing pictures. The best science is that which is observed and where the observer can make conclusions based on the evidence. Since not everyone has the fortune to observe this directly, I would posit that we can at least bring back some of impressions to help illustrate the pictures. The story needs to provide the viewer with context and tools to be able to see what they are observing. Try and imagine stepping into this world. These photographs can only let you peak into what is out there. Imagine these photographs being 50 feet tall. Now you start to get it. Think what these adventurers felt when for the first time – the things they read in text books, heard about in lecture, became real as they actually stepped into that world 72 degrees north. The group has selected what we hope are some of the best images for helping create a story about the Arctic. These are not simply “shots” but they contain criteria of illustrating geological, arctic and earth systems. Each picture contains hundreds of details at both the micro and macro level. We have tried to list some of these. As a collective whole the selections should allow the viewer to get a sense of the enormity, the scale and hopefully the emotion experienced when the students were there. But while pictures are intended to tell us a visual story – they can be left to the interpretation of the beholder. As such we need to guide the viewer so that they understand the impact and what these pictures represent. The Arctic. The word is often used as a synonym for frigid – in other words, cold. It is also thought of as big. Empty. A community where only the hardiest life survives. Our perception of the Arctic is formed by what we read and see – usually from others. Even our venture into the Arctic was only a thin slice of both time and place. An outlier? Perhaps. But add these outliers to your own collection of thoughts and eventually you will build an impression of a world unto itself. What is the Arctic? To begin, it seems easiest to think about the surface of the earth that lies north of the Arctic Circle. The Arctic Circle is located roughly 1823 miles north of Carlisle and 4592 miles north of the equator. As the earth spins, rotates, wobbles and orbits the sun, it tilts just far enough so once a year the sun stays below the horizon and once a year the sun never dips below the horizon. This is known as the Arctic Circle and is the maximum geographical line (latitude) 66.33 degrees north of the equator where perpetual daylight and darkness occur at least one day of the year. The Arctic is more than just a land encompassed by a geographical line. It is an environment defined by climate. The concept of climate is the key. Climate is defined by the weather conditions that prevail over a long period of time that give rise to both the geological forces that shape the earth’s surface, and the development of indigenous organisms that have evolved to survive under these circumstances. The Arctic is not a geological force – it is an environment controlled by light and temperature. This provides a unique situation that helps to modulate our planet’s atmosphere, shape the earth’s surface and test organic life. The result of this gives rise to frozen grounds and tundra, glaciers* and ice sheets* whose mass is so great it causes the underlying rock to sink, only to rise again after it has melted. These large masses of accumulated ice move slowly and with enormous power to pulverize and carve rock. They dam rivers and deposit moraines* and glacial till*. But it is not just large scale ice doing the work. At the microscopic level, the freeze thaw cycles (Gelifraction)* involve crystallization of water expanding and melting ever relentlessly to split the rock. The constant freeze and thaw lets soil flow across deeper permanently frozen land. At a grand scale, the cold freezes the oceans and provides “bridges” for life to wander. The ocean ice in turn blocks the sun’s rays from heating the waters below, affecting worldwide ocean currents and creates unique environmental niches for life. This ice can block ports, eventually breaking up and invading shipping lanes well south of its original boundaries. The arctic is the theater. The setting is cold climate conducive to cumulative forces to shape the land and eliminate only those organisms that can survive. Whilst large catastrophic, cataclysmic events are the headlines that punctuate geological history, it is in fact the slow uniform processes, unseen or felt, the proverbial “grains of sands”, that over time, slowly and indubitably write the script. The past cooler average temperature of the earth allowed massive continental glaciers to shape the land well south of today’s boundaries. Jökulhlaup* or glacial lake outbursts from the last ice age scoured Eastern Washington and formed the scablands* of Central Washington, depositing the wine rich loess soils where summertime temperatures today exceed 100 degrees. Whether it is in the Puget Sound or Great Lakes we also marvel at deep water formed by glaciers moving across the countryside. All processes that can be seen in the Arctic region today. It is into this world that we ventured – to observe, to validate our perceptions of the Arctic and to explore. At the northern end of Baffin Island - 5019 miles north of the Equator, lies the town of Pond Inlet on the edge of Eclipse Sound. There is a simple airport with a gravel runway, a pipe from the edge for fuel supplies, very limited summer tourism, a few grocery stores, and it is home to approximately 1,300 year-round residents, mostly Inuit who survive on subsistence hunting and government subsidies. Dirt roads run through the town and four wheel tracks disappear out into the tundra. Water is supplied by tank trucks. 22 Kilometers north of town lies Bylot island and you can clearly see the Sirmilik glacier from town (Sirmilik means the “place of glaciers” in Inuktitut so the reference is somewhat redundant). It is thought that the earliest humans were the Ancient Pre-Dorset people who may have transited from Greenland over ice bridges 3000 years ago. While camping out on Curry Island located to the southeast of Pond Inlet, we did find remains of an old “singer” sewing machines near remains of sod houses indicating possible outposts in the last 100 years. Archaeological evidence in the area suggests possible Thule culture, dating approximately as far back as 1,000 years ago. Today, it is the Inuit who remain. Our journey began in Ontario flying to Iqaluit on a jet plane half of which was configured for cargo and half for passengers. Call it Arctic priorities or irony, but supplies went where first class seats would be, while the rest of us flew economy. As we waited for our aircraft to Pond Inlet, we stepped outside to swarms of small black flies typical of the brief summer. Leaving Iqaluit, the two engine ATR 72 turbo prop engine took off late and hopscotched its way first to Clyde River on Baffin Island’s East coast flying by glaciated valleys and rivers of ice. Clyde River (est. population 820) is an outpost, fueling stop, and often a holding area while weather clears further north. Now it was time itself you started to notice. It appeared not to be happening. Our watches said one thing, our bodies felt stuck at mid-day. Just six weeks after the earth began to tilt inevitably from its furthest point north, the solar rays still provided ample day light, supercharging the short growing season. Given the short season, everything had to happen 24/7. It was almost 9 PM but felt like the middle of the afternoon. And when we landed in “Pond” it was still early afternoon – only now, our watches told us it was 10:30 PM. Other than water, we were now reliant on what had been brought north. "Geology and Exploration." Baffinland. N.p., n.d. Web. 03 May 2016. <http://www.baffinland.com/the-project/geology-and-exploration/?lang=en>. "Sirmilik National Park." Nunavut Tourism -. N. P., n.d. Web. 19 Apr. 2016. <http://nunavuttourism.com/parks-special-places/national-parks/sirmilik>. The Arctic Circle alone encompasses 8,125,200 Square miles (13,076,267 square Kilometers.) This is less than 4 percent of the total earth’s surface. Yet, this little bit of real estate is somehow responsible for modulating the earth’s climate. Why travel or bother to study the arctic? There is no doubt that it is inspirational. But what is its relevance? This is the critical question. The simplest and most self-serving answer is that it enables us to understand the impact this region has on humans. There are plenty of additional reasons, some esoteric, others spiritual, some about being part of a web of life. There is also the purely hedonistic sense of adventure some of us enjoy. However, this question is more about the science of studying the Arctic, that is, what impact does the it have on life? Without context and first-hand experience, it is difficult to draw conclusions. Real science means being to observe for yourself what is going on. Climate is not the only reason to study the Arctic. The study of the earth systems (“the four basic elements of the Earth system air (atmosphere), water (hydrosphere), land (geosphere) and life (biosphere)” in the Arctic allows us to see a more complete picture. The first thing to understand is that as large as our planet seems in bulk, the surface of the earth is an exceedingly thin veneer which we depend on. The death zone for human survival without supplemental oxygen is generally less than 8000m or just under five miles high. The average top soil which we rely on to grow trees and plants critical to the air we breathe and food to sustain life is less than 2 meters! By studying the arctic environment, we can observe the early formation of soils, the shaping of physical structures, how life is adapted to extreme conditions and the effect of water in both sustaining life and eroding the landforms, which in turn can tell us about the rest of the planet. How does this work? James Hutton, an 18th century naturalist is often quoted. “The present is the key to the past”. By figuring out what processes are shaping the land today we can assume that the geology and geography of the past were formed by the same processes. Therefore, we can “read” the ancient landforms and determine the events in the past that shaped them. This is how we know by looking at the evidence that the planet has been much cooler in the past and that the ice sheets were much further south. If we “dig” further than we can also understand that, at times, it was also warmer. We can also determine that these “cycles” took place much more slowly than they are going on today. All of which helps us better grasp the impact these changes will have in the future. Today, yesterday then tomorrow. “For the last 50 years, global temperature rose at an average rate of about 0.13°C (around one-quarter degree Fahrenheit) per decade—around twice as fast as the 0.06°C per decade increase observed over the previous half-century” Dahlman, LuAnn. "Climate Change: Global Temperature | NOAA Climate.gov." Climate Change: Global Temperature | NOAA Climate.gov. NOAA, n.d. Web. 05 May 2016. <https://www.climate.gov/news-features/understanding-climate/climate-change-global-temperature>. "Arctic FAQ - Frequently Asked Questions about the Arctic." Arctic FAQ - Frequently Asked Questions about the Arctic. NOAA, n.d. Web. 20 Apr. 2016. <http://www.arctic.noaa.gov/faq.html#4>. "ESS in a Nutshell." Earth System Science in a Nutshell. N.p., n.d. Web. 21 June 2016. <http://serc.carleton.edu/introgeo/earthsystem/nutshell/index.html>. So what did we see? Rivers of ice and water. Glaciers, ice caps, ice sheets and icebergs. Everything is in motion. As the ice on land melts and drains they feed fast flowing rivers that fluctuate and flood with the time of day. Standing at the base of a 50-foot-tall moraine, we are separated from the stone filled debris pile by an opaque river full of ground up glacial flour, listening to the boulders tumble past us with no safe passage across. At the toe of the glacier, the outflow spreads out onto sheets of ice. They betray the solar heat causing the torrent of water to block our way, while the river filled with abrasives cuts a sharp incision into the earth. We tentatively step into the river, feeling our way with our toes, the ice cold water instantly numbing our legs. A pot hole. A boulder rolls under our feet. Its confirmed. No safe passage. It’s even harder to realize but the entire field of ice we are looking at, is actually flowing, applying millions of pounds of its weight to the underlying surface, unrelenting in its advance. The glacier is cutting and carving wide U shaped valleys, eventually leaving behind smooth surfaces marked by striations caused by rocks caught in the underbelly of the ice behemoth, pulling along, scratching and gouging the subsurface. Glaciers have been nicknamed buzz saws, conveyor belts that cut, crush and re-contour the earth. Breaking up and accumulating the rock and soil, they drag, push and compress them into “mounds of earth” or moraines. The relentless movement of the glaciers pluck and grind the surrounding landscape carrying it effortlessly along. Where two glaciers meet the debris causing beautiful long lines (medial moraine*) to mark their intersection. Other times the glacier grinds and gathers rock from the surrounding mountains. Dragging and depositing this collection laterally along its sides, (hence the term, lateral moraine*) it forms boundaries marking its passage. Playing the role of a giant bulldozer and conveyer built into one, the glacier pushes everything in its path forward and transports its collection of stones into a pile marking the terminus of its advance (Terminal Moraine*). Even the tundra around us is flowing. The tundra soil is slowly built up over tens and hundreds of years, supporting the sparse arctic vegetation during the short summer growing season. But it is only the surface that thaws. The tundra acts to insulate the permafrost below, which in turn provides a slippery base. The soil loosely bound by the roots of the arctic grasses succumbs to gravity and the water laden soil flows along the top of the permafrost. Solifluction*, or the movement of the earth on top of permafrost, forms ripples, edge currents, even “soil” falls mimicking a slow motion river. And then there are the cliffs. Steep sides of rock shattered by the extreme cold and expanding to spall sheets of rock forming talus cones, piles of cracked angular boulders. Where the water becomes trapped and frozen between the stones, these too move down, as rock glaciers*. The action does not stop there on land. Taking to water we float in Fjords in kayaks, continuing to observe and explore. Fjords* are described as deep narrow inlets. At this point, deep is ½ mile of cliffs above us and 1 mile of water underneath. Wide at this point is 1 ½ miles across and almost 14 miles in eclipse sound to the east of us. Ancient ice once covered all of this and flowed over the very waters we paddled on. We are surrounded by the evidence of times of colder climates when the advance of glaciers extended out into the sea. Gravity, the force associated with the Earth’s mass, does not originate at the Earth’s surface nor does it stop at sea level. It comes deeper from the very center of the planet. Gravity keeps pulling the glacier down following the contours of the ocean bottom. In the past, with more water trapped in the paleo-ice sheets, the ocean levels were as much as 300 feet lower. Glaciers could travel further out across the land before reaching the water. Sitting in a kayak looking up at near vertical cliffs towering 2700 feet above, you realize that the glaciers were massive. Glacier ice is frozen (solid) water and weighs about 1 gram per cubic centimeter or about 62 pounds per cubic foot. A square foot column of ice that tall would weigh 167,794 pounds! Depending whether the surrounding water is salt or fresh – only about 1/8th of the ice will be above the water. Which means a 100 foot wall of ice needs 700 feet of water to “float”. This combined with its enormous mass means the glacier, while “less dense” in water, is still grinding and pulverizing what lays below. The ice is compacted under its own weight and it has even more density or mass. The compression causes it to flow. Rivers of ice. We floated. We looked around. A light breeze pushing us so ever gently. A few strokes to the edge. Stop. Look closely at the edges. Swirls of black rock embedded in the granite*. You realize that the rock known as gneiss*, shows it too has been deformed, which means it’s buried at such a depth where the overlying rock is compressed to a point where it became “plastic” and flowed. Rivers of rock. We are in the Arctic – during its brief respite from the cold blowing snow and ice. Everything is exposed for those few months. The relative warmth of the day, does not change the past nor the present day winters that cover this land, freezing and shattering the rock, and ever so slowly changing the landscape to what we see today. "Water Density." (water Properties), USGS Water Science School. N.p., n.d. Web. 23 May 2016. <http://water.usgs.gov/edu/density.html>. The Arctic provides a unique laboratory to observe not only the climatic changes but the forces that shape the earth. One must venture there to observe these processes in order to understand. The Arctic affects the climate and the geography of the physical world. Back to the question. Why study the Arctic? To understand. So we are better prepared. To act. To manage. To survive. Our institutions and resources today are getting better at providing us with data and interpretations. Although ask a scientist what facts there are, and you are likely to hear that they have hypotheses, or better yet there are theories. It’s hard to come up with facts. Nonetheless, hypotheses and theories need testing. The best way to test is to experiment and look at and observe the actual data first hand. You have to get out into the field to understand what it really means. This was the challenge posed to our group. They were asked to take what concepts and theories they had studied and verify this knowledge. To interpret. What were their observations both from a science perspective as well as an intuitive response? What they felt, as they left the “classroom” and entered this very real world. The results are a collaboration and collection of experiences. Four students, one professor, two Dickinson alumni and a 6th grade science teacher headed out to experience the Arctic. The Baffin Island trip is one of the most memorable trips I have taken. Being able to travel and camp in such a remote location is unforgettable. When I expressed interest in going on this trip I did not know what to expect, I had never heard of Baffin Island. I was going from a New York City humid summer to an Arctic chilly weather with 24-hr daylight. Everything I knew about that region was from books and documentaries, but actually traveling there and living it was surreal. Traveling from Ottawa to this small airport that looked like a spaceship in Iqaluit, capital of Nunavut territory, I could see how the physical environment changed drastically, this was a very remote place. On the plane from Iqaluit to Pond Inlet I was in disbelief as I looked on the window of the small plane. I couldn’t believe I was looking at icebergs floating in the ocean, glaciers, and other geological features that I had learned about in my geology classes, from U-shaped valleys to Fjords. Landing in this small hamlet by the water called Pond Inlet after a long day of traveling was very exciting, finally we arrived to our destination. First night there having dinner while the sun was still shinning outside was definitely confusing. For many in our group and I, it still didn’t feel real; we were actually in this very remote place having salad, mashed potatoes, and meat and deserts amongst many other goodies. In the next two days we were able to walk around and explore the small town with the help of our two guides. Few people and I were able to go to the local store and walk around. Immediately the prices caught our eyes, a can of Coca-Cola for $5 seemed ludicrous to us but thinking of the amount of energy and the remote locations it made sense. We were able to walk around, learn about the history of the hamlet, and meet some of the locals who were very welcoming. It was very enjoyable to work together as a team to prepare for the boat trip to Bylot Island and Sirmilik National Park, loading the food, and the sea kayaks. It was breathtaking the ride over to Bylot Island as we were escorted by a flock of birds the whole way. There was a sense of peace around us and many times there were moments of quietness as all of us looked at the island and the glacier in distance. Arriving on the island and setting up was another experience, it was my first time setting up a tent, so Marcus and I set it up since were sharing the tent together. All of us set up the tent close to each other on a higher terrace overlooking the main tent and hangout area, and the water. For the next few days we explored around the area from hiking up to the glacier to looking at the hoodoos next our camp. We talked about the geology of this area and history as well as the effect of climate change. We were able to see the glacier terminus and terminal moraines. As we hiked we were able to see slope failure of permafrost soil, revealing ice lenses. As a result of permafrost melting because of increase global temperatures we saw some geomorphological features like ice wedges, solifluction, and cracks forming at the edge of a permafrost area. All this was incredibly educational and beneficial because I was able to see these features instead of just reading about them. The second part of the trip was amazing in its own way as we were able to do different activities. Passing through the fjords and seeing the enormous cliffs it was impossible to not think how the ice has cut the rock and formed this topography over millions of years. On Curry Island we were able to go sea kayaking and explore the island and also some icebergs. 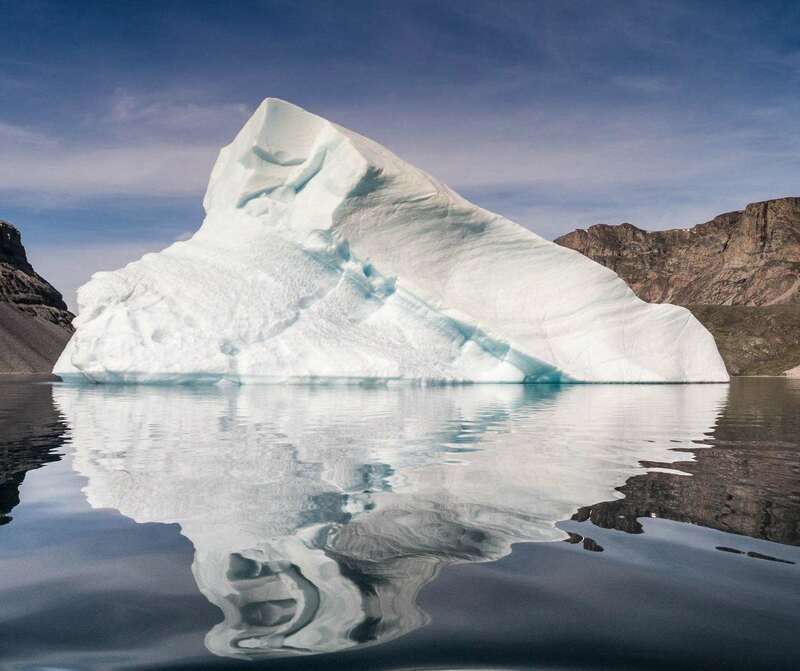 It was an incredible feeling to kayak around an iceberg, the sheer size and reflection was breathtaking. Along our kayak route we were able to see sea lions and many kinds of fish such as char. During the time there we had many discussions on continental rebound and how looking at the topography of the surrounding area it is clear that at some point the land was depressed by the huge weight of ice sheets, as a result we saw layered beaches. It was also very interesting to look at the arctic vegetation. Trees do not grow in this region as it is beyond the tree line so most of the plants grow relatively close to the ground like herbs, lichens, mosses, and arctic poppy. Before leaving we were able to see a family of narwhales as anticipated by many of us. Of course I could not come back home without doing a polar plunge into the arctic waters, something that I will never forget. Lastly one thing that I noticed and enjoyed very much is the absence of noise. We live in a world where there is a lot of noise pollution and being in this environment was magical. The tranquility of the environment gave the experience a different meaning. These are just some of the things we did on our trip. It is a trip that I still think about because we experienced something that is rare. Not many people are able to go and experience a place like that. It was just us in a pristine nature, and it doesn’t get better than that. Before the trip began, my understanding of Baffin Island was almost exclusively based on the way the land had been formed in geologic terms. This perspective was useful during our hikes through the arctic landscape as we tried to understand our surrounding, like why we saw variations in rock type, vegetation or elevation. 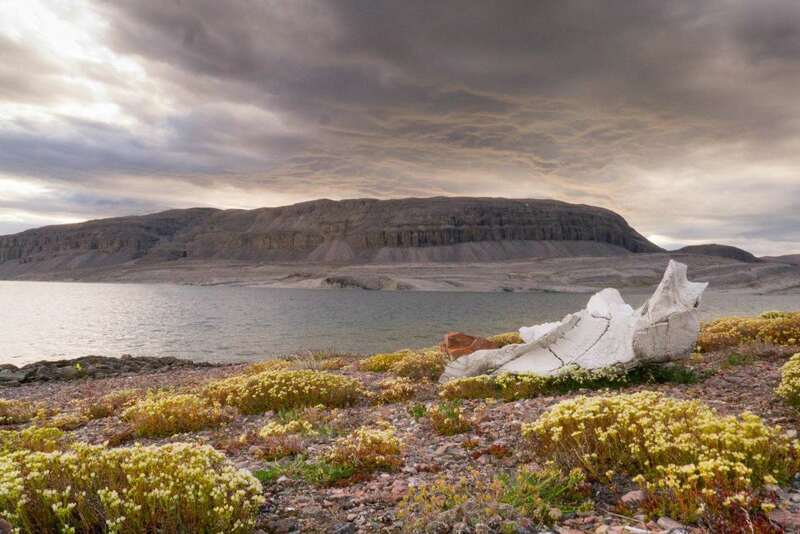 Baffin Island has some truly compelling surroundings: ancient folded Precambrian rocks, soaring cliffs, glaciers, dramatic u-shaped valleys, and icebergs to name a few. The lack of trees will always stick in my mind as an interesting aspect of the tundra. Without them it meant we could see geologic features more easily, and often over a great distance. However, the lack of trees also meant there was nothing to use for scale. A hill that appeared only a short distance away would in fact prove to be a day’s hike out. The pebbles at the toe of the glacier would turn into boulders as we approached. It was this kind of change in perspective that made me scrutinize everything in sight, because a first glance only told part of the story. The same can be said of my initial understanding of Baffin from a geologic perspective. The geologic features were spectacular to see up close after only having seen pictures and articles. Through the trip though these sights took on a significance beyond a strictly geologic context. We weren’t just looking at a lone glacier, but also the valley it had carved, the fresh meltwater delivered to the tundra plants who in turn provide shelter to the birds and small mammals living there. Geology is a lens through which you can begin to understand the complexities of a landscape, and that is why I have always been fascinated by the subject. The trip to Baffin Island was ultimately more than a geology lesson, it was a brief but powerful insight into the complex overlapping facets of the region. In totality, I got a real sense of impermanence, and what that means for the Arctic and the whole world. Growing up, we imagine our world as unchanging and dependable, but that is not the case. The world is just as unstable and sensitive as we are; it is constantly changing. The conditions facing the Arctic, now, are tragic. For the native Inuit people, this means they can longer predict weather patterns, and their hunting yields decrease every year. Their way of life is at risk all because of a natural resource and the greed of nations. They are the canary in the coal mine, but we’re too dumb to see it. It’s been a couple of years and I still can’t believe that I traveled North of the Arctic Circle! I believe that the expedition to Baffin Island set the tone for the rest of my Dickinson experience. 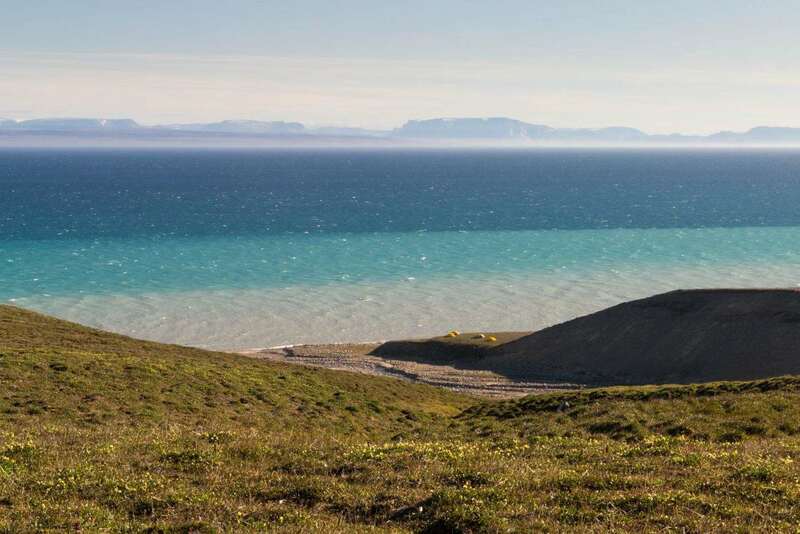 I had the privilege to witness climactic changes at the local level in Pond Inlet by connecting with the community and asking questions, while also being able to hike, kayak, and camp in a pristine area where the effects of global warming were clearly present. Baffin Island strikes me as a memory of pure adventure and wonder. When I look back at the photos from the trip the landscapes still blow my mind! I am so thankful for every U shaped valley, metamorphic outcrop, and sandstone contact that we encountered. One of my most memorable experiences occurred when our guide advised us to stay very quiet because he had spotted a pod of narwhal in the near waters. About 5 minutes into the silence, our entire group witnessed one of the most majestic animals on Earth. Which other city kid from Los Angeles, California could have ever dreamed of spotting this animal in the wild? It feels like a dream to this very day. "Baffin Island". Encyclopædia Britannica. Encyclopædia Britannica Online. Encyclopædia Britannica Inc., 2016. Web. 19 Apr. 2016 <http://www.britannica.com/place/Baffin-Island>. "Baffin Island, Nunavut, Iqaluit, Canada, Jobs, Maps, Photos, Weather." BAFFIN ISLAND.CA. N.p., n.d. Web. 19 Apr. 2016. <http://www.baffinisland.ca/>. Dahlman, LuAnn. "Climate Change: Global Temperature | NOAA Climate.gov." Climate Change: Global Temperature | NOAA Climate.gov. NOAA, n.d. Web. 05 May 2016. <https://www.climate.gov/news-features/understanding-climate/climate-change-global-temperature>. McLeish, Todd. Narwhals: Arctic Whales in a Melting World. N.p. : U of Washington, 2013. Print. Neuendorf, Klaus K. E., James P. Mehl, and Julia A. Jackson. Glossary of Geology. Alexandria, VA: American Geological Institute, 2005. Print. “Water Density." (water Properties), USGS Water Science School. N.p., n.d. Web. 23 May 2016. <http://water.usgs.gov/edu/density.html>. Bylot Island is located off the northern tip of Baffin Island, Nunavut, Canada. It is accessible through the communities of Pond Inlet (Mittimatalik) and Nanisivik, both found on Northern Baffin Island. The field research covers the south plain of the island (1600 km2), but the research station is located in a large glacial valley at the southwest end of the island. Pond Inlet (Mittimatalik; 1300 inhabitants) is located at 85 km. INTERACT - International network for terrestrial research and monitoring in the arctic (www.eu-interact.org). 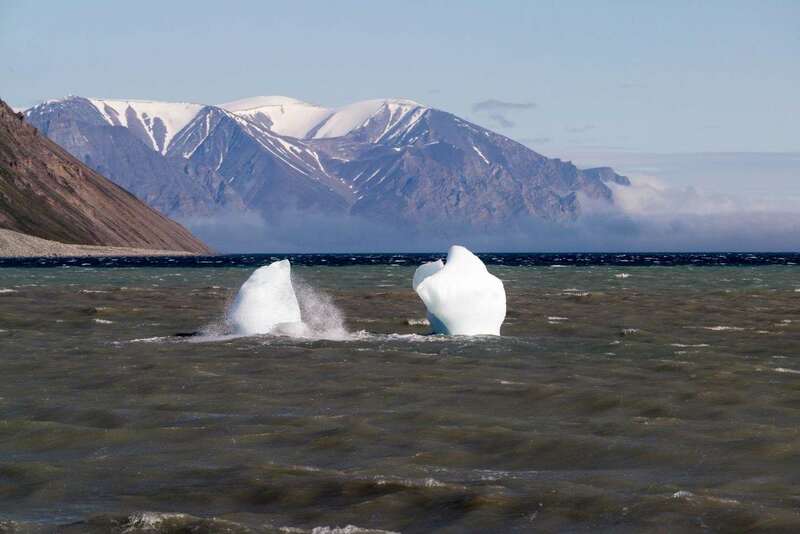 Much of Bylot Island is covered by high mountain peaks and glaciers. These are the Byam Martin Mountains which form a part of the larger Arctic Cordillera extending from the eastern margin of Baffin Island all the way to Ellesmere Island. The remainder of Bylot Island, and in particular its southern plain, is characterized by extensive low-elevation areas covered by heterogeneous tundra vegetation. The vegetation found in the wetlands is characterized by the presence of sedges, grasses, and many brown moss species. In contrast with the wetlands, dryer areas are found on slopes, hills and elevated terraces surrounding the valley lowlands, as well as on the rims surrounding tundra polygons. The better drained, drier soils of these habitats allows for distinct plant communities, including forbs, grasses, and shrubs. These areas commonly referred to as uplands, account for 90% of the south plain surface whereas wetlands account for only 10%. The wetlands of the south plain are a habitat of rare plant quality and productivity for an arctic environment. Benefiting from this “polar oasis” are more than 360 species of plants, 10 mammal species, and 74 bird species. Considered as an important site for many migratory birds, Bylot Island was declared a Migratory Bird Sanctuary in 1965. Amongst the migratory species taking advantage of the lush wetland vegetation is the Greater Snow Geese. The south plain holds one of the world’s largest breeding colonies of Greater Snow Geese and the wetlands of the Qarlikturvik valley represent their main brood-rearing site on the island. In addition to the geese, other herbivores are the Brown and Collared Lemmings, Arctic Hare, Caribou and Rock Ptarmigan. The main terrestrial predators are the Arctic Fox, Long-tailed Jaeger, Parasitic Jaeger, Glaucous Gull, Common Raven, and Snowy Owl. Food web relationships are summarized in Gauthier et al. (2011): Ecoscience 18: 223-235. No communities live on Bylot Island. The nearest community is Pond Inlet (Mittimatalik) found on northern Baffin Island, Nunavut, Canada. "Bylot Island Field Station." Centre D'études Nordiques. N.p., n.d. Web. 04 May 2016. <http://www.cen.ulaval.ca/en/page.aspx?lien=stationbylot>. We all have imagination. We think about how things should be. Photography is meant to document how things are. However, there are fundamental problems with taking a picture. One) It is only a blink in time, a thin slice of the world around you. Captured as a moment. And how representative is it of an entire system that represents almost 8 percent of the world. Two) It only captures one of the senses that is available to humans. Even then a camera places the image into a 2 dimensional format. It needs to do more. What about your peripheral vision excluded when the picture is squeezed onto a flat array of silicon pixels? What about your other senses? The wind on your face. The cold in your hands. The utter silence or cacophony of sound surrounding you. The taste of salt or grit of sand. Three) Scale. On a clear day we can see almost 100 miles. Some of these mountains are 3500 feet tall. Across the water its 13.5 miles. The base of some of the glaciers are 1.5 miles across. The glaciers can be several hundred feet thick. Nature is big. A photograph – not so much. As you observe the photographs, think back to the stories. Immerse yourself. Imagine. And hopefully you will validate this with your own experiences or go and see this vast arena called the Arctic. Included under the pictures are some of the reactions/comments by the group when they looked at the picture. Hopefully these images will inspire but more important help you to understand the relevance of studying the arctic. Perpalaj, Aleksander Aleksander Perpalaj'14 Environmental Geology major. Lives in New York City. Works as a Lead Science Teacher for the NYC Dept. of Education. Plans to pursue an advanced degree in Geology. Loves to travel and spend times in the outdoors. FJORD (Pron: fyord) (a) A long, narrow, winding, glacially-eroded inlet or arm of the sea, U-shaped and steep-walled, generally several hundred meters deep, between high rocky cliffs or slopes along a mountainous coast; typically, with a shallow sill or threshold of solid rock or earth material submerged near its mouth, and becoming deeper inland. A fiord usually represents the seaward end of a deeply excavated glacial-trough valley that is partially submerged by drowning after the melting of the ice. Examples: along the glaciated coasts of Alaska, Greenland, and Norway. (b) Any embayment of the seacoast in a Scandinavian country regardless of the adjacent topography, as afjard in the low flat Swedish coast or aförde in eastern Denmark. Etymol: Norwegian. Cf: estuary; ria; sea loch. Var. spelling: fiord. GELIFRACTION (gel-i-frac'-tion) The mechanical disintegration, splitting, or breakup of a rock or soil due to the great pressure exerted by the freezing of water contained in cracks or pores, or along bedding planes; term introduced by Bryan (1946, p.640). Syn: frost shattering; frost splitting; frost riving; frost bursting; frost weathering; frost wedging; gelivation; congelifraction. GEOMORPHOLOGY (ge"-o-mor-phol'-o-gy) (a) The science that treats the general configuration of the Earth's surface; specif. the study of the classification, description, nature, origin, processes, and development of present landforms and their relationships to underlying structures, and of the history of geologic changes as recorded by these surface features. The term was applied widely in Europe before it was used in the U.S., where it has come to replace the term physiography and is usually considered a branch of geology or geography; in the British Commonwealth, Japan and many other countries, it is usually regarded as a branch of geography. Geomorphology as a named science is barely more than a century and a half old (Tinkler, 1985), with the name first appearing in the German language in 1858. A young associate of John Wesley Powell, WJ McGee (indeed "WJ" rather than "W.J as is often mis-referenced), introduced the term into English in 1888 (McGee, 1888a,b). See also: physical geography. Syn: physiographic geology; geomorphic geology; geomorphy. (b) Strictly, any study that deals with the form of the Earth (including geodesy, and structural and dynamic geology). This usage is more common in Europe, where the term has even been applied broadly to the science of the Earth. (c) The features dealt with in, or a treatise on, geomorphology; e.g., the geomorphology of Texas. GLACIER (gla'-cier) (a) A large mass of ice formed, at least in part, on land by the compaction and recrystallization of snow, moving slowly by creep due to gravitational forces, and surviving from year to year. Included are small mountain glaciers as well as ice sheets of continental size, and ice shelves which float on the ocean but are fed in part by ice formed on land. Cf: ice stream; ice sheet; ice cap. (b) Less preferred syn. of alpine glacier. (c) A term used in Alaska for floodplain icing or a mass of ground ice. (d) A streamlike landform having the appearance of, or moving like, a glacier; e.g. a rock glacier. Etymol: French "glace", "ice". GNEISS A foliated rock formed by regional metamorphism, in which bands or lenticles of granular minerals alternate with bands or lenticles in which minerals having flaky or elongate prismatic habits predominate. Generally less than 50% of the minerals show preferred parallel orientation. Although a gneiss is commonly feldspar- and quartz-rich, the mineral composition is not an essential factor in its definition. Varieties are distinguished by texture (e.g., augen gneiss), characteristic minerals (e.g., hornblende gneiss), or general composition and/or origins (e.g., granite gneiss). Cf: gneissic; gneissoid; gneissose. GRANITE [petrology] (a) In the IUGS classification, a plutonic rock with Q between 20 and 60 and P/(A+P) between 10 and 65. (b) A plutonic rock in which quartz constitutes 10 to 50 percent of the felsic components and in which the alkali feldspar/total feldspar ratio is generally restricted to the range of 65 to 90 percent. 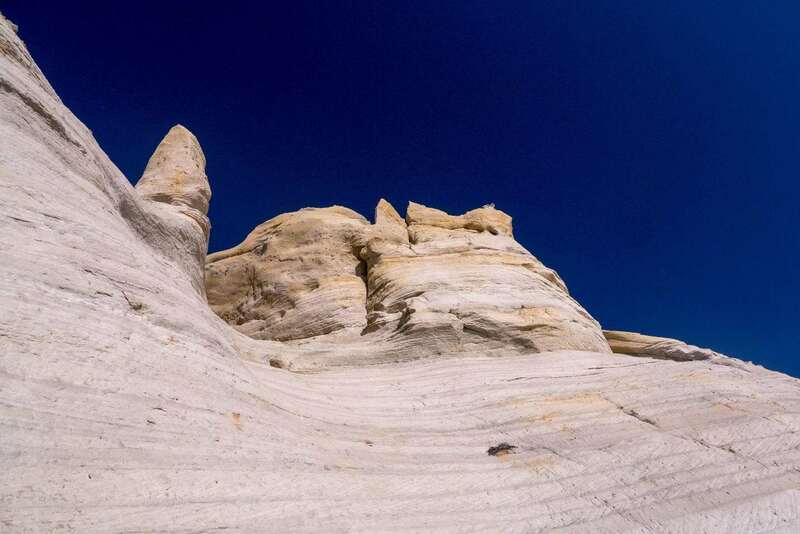 Rocks in this range of composition are scarce, and sentiment has been growing to expand the definition to include rocks designated as adamellite or quartz monzonite, which are abundant in the U.S. (c) Broadly applied, any holocrystalline, quartz-bearing plutonic rock. Syn: granitic rock. Etymol: Latin "granum", "grain". HANGING VALLEY [glac geol] A glacial valley whose mouth is at a relatively high level on the steep side of a larger glacial valley. The larger valley was eroded by a trunk glacier and the smaller one by a tributary glacier, and the discordance of level of their floors, as well as their difference in size, is due to the greater erosive power of the trunk glacier. Syn: hanging trough; perched glacial valley. ICE SHEET A glacier of considerable thickness and more than 50,000 sq km in area, forming a continuous cover of ice and snow over a land surface, spreading outward in all directions and not confined by the underlying topography; a continental glacier. Ice sheets are now confined to polar regions (as on Greenland and Antarctica), but during the Pleistocene Epoch they covered large parts of North America and northern Europe. Armstrong and Roberts (1958, p. 7) also applied the term to any extensive body of floating sea ice, but it should be restricted to land ice. Not to be confused with sheet ice. ISOSTATIC REBOUND Aka ISOSTASY (i-sos'-ta-sy) The condition of equilibrium, comparable to floating, of the units of the lithosphere above the asthenosphere. Crustal loading, as by ice, water, sediments, or volcanic flows, leads to isostatic depression or downwarping; removal of load, to isostatic uplift or upwarping. Two differing concepts of the mechanism of isostasy are the Airy hypothesis of constant density and the Pratt hypothesis of differing root depth and differing density and constant root depth. See also: isostatic compensation; depth of compensation; glacio-isostasy; hydro-isostasy. JöKULHALUP (Jök ul-hlaup) An Icelandic term for glacier outburst flood. LATERAL MORAINE (a) A low ridge like moraine carried on, or deposited at or near, the side margin of a mountain glacier. It is composed chiefly of rock fragments loosened from the valley walls by glacial abrasion and plucking, or fallen onto the ice from the bordering slopes. (b) An end moraine built along the side margin of a glacial lobe occupying a valley. Cf:flanking moraine. Syn: side moraine; valley-side moraine. MEDIAL MORAINE (a) An elongate moraine carried in or upon the middle of a glacier and parallel to its sides, usually formed by the merging of adjacent and inner lateral moraines below the junction of two coalescing valley glaciers. (b) A moraine formed by glacial abrasion of a rocky protuberance near the middle of a glacier and whose debris appears at the glacier surface in the ablation area. (c) The irregular ridge left behind in the middle of a glacial valley, when the glacier on which it was formed has disappeared. Syn: median moraine. MORAINE [glac geol] (mo-raine') A mound, ridge, or other distinct accumulation of unsorted, unstratified glacial drift, predominantly till, deposited chiefly by direct action of glacier ice, in a variety of topographic landforms that are independent of control by the surface on which the drift lies. The term was probably used originally, and is still often used in European literature, as a petrologic name for till that is being carried and deposited by a glacier; but it is now more commonly used as a geomorphologic name for a landform composed mainly of till that has been deposited by either a living or an extinct glacier. Etynxol: French, a term used by Alpine peasants in the 18th century for any heap of earth and stony debris. The term was introduced by Saussure in 1779. ROCK GLACIER A mass of poorly sorted angular boulders and fine material, with interstitial ice a meter or so below the surface (ice-cemented) or containing a buried ice glacier (ice-cored). It occurs in high mountains in a permafrost area, and is derived from a cirque wall or other steep cliff. Rock glaciers have the general appearance and slow movement of small valley glaciers, ranging from a few hundred meters to several kilometers in length, and having a distal area marked by a series of transverse arcuate ridges. NAThen active, they may be 50 m thick with a surface movement (resulting from the flow of interstitial ice) of 0.5-2 m/yr. Rock glaciers are classified in plan as lobate, tongue-shaped, or spatulate. Cf: block tream; chrystocrene. SCABLAND (scab'-land) An elevated area, underlain by flat-lying basalt flows, with a thin soil cover and sparse vegetation, and usually with deep, dry channels scoured into the surface. An example is the Columbia lava plateau of eastern Washington, which was widely and deeply eroded by glacial meltwaters. See also: channeled scabland; scabrock. SOLIFLUCTION (so-li-fluc'-tion) The slow viscous downslope flow of waterlogged soil and other unsorted and saturated surficial material, normally at 0.5-5.0 cm/yr; esp. the flow occurring at high elevations in regions underlain by frozen ground (not necessarily permafrost) that acts as a downward barrier to water percolation, initiated by frost action and augmented by meltwater resulting from alternate freezing and thawing of snow and ground ice. The term was proposed by Andersson (1906, p.95-96) as "the slow flowing from higher to lower ground of masses of waste saturated with water”, but as he did not state explicitly that it referred to flow over frozen ground, the term has been extended to include similar movement in temperate and tropical regions; also, it has been used as a syn. of soil creep, although solifluction is generally more rapid. It is preferable to restrict the term to slow soil movement in periglacial areas. Also spelled: solifluxion. Syn: soil flow; soil fluction; sludging. TILL Dominantly unsorted and unstratified drift, generally unconsolidated, deposited directly by and underneath a glacier without subsequent reworking by meltwater, and consisting of a heterogeneous mixture of clay, silt, sand, gravel, and boulders ranging widely in size and shape. Cf: stratified drift; moraine syn: boulder clay; glacial till; ice laid drift. TERMINAL MORAINE (a) The end moraine, extending across a glacial valley as an arcuate or crescentic ridge, that marks the farthest advance or maximum extent of a glacier; the outermost end moraine of a glacier or ice sheet. It is formed at or near a more-or-less stationary edge, or at a place marking the cessation of an important glacial advance. Obsolete syn: marginal moraine. (b) A term sometimes used as a syn. of end moraine. TUNDRA SOILS (a) Soils characteristic of tundra regions. (b) A zonal great soil group consisting of soils with dark-brown peaty layers over grayish horizons mottled with rust and having continually frozen substrata; formed under frigid, humid climates, with poor drainage, and native vegetation of lichens, moss, flowering plants, and shrubs. Not used in current U.S. system of soil taxonomy.